Originally, Volendam was the location of the harbor of the nearby Edam, which was situated at the mouth of the IJ bay. In 1357, the inhabitants of Edam dug a shorter canal to the Zuiderzee with its own separate harbor. This removed the need for the original harbor, which was then dammed and used for land reclamation. Farmers and local fishermen settled there, forming the new community of Vollendam, which literally meant something like 'Filled dam'. In the early part of the 20th century it became something of an artists' retreat, with both Picasso and Renoir spending time here. The majority of the population belongs to the Roman Catholic Church, which is deeply connected to the village culture. 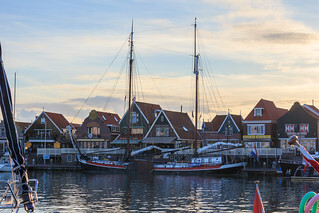 Historically, many missionaries and bishops grew up in Volendam. Today there is the chapel of Our Lady of the Water, which is located in a village park.